On March 4, 2016, Joey Martin Feek claimed victory over her cancer battle and flew away. She lived a charmed life, fulfilled all her dreams, worked hard to inspire, educate, and entertain, and shined a light for Jesus Christ. She also lived a well-loved life, leaving behind three precious daughters, Indiana, Hopie, and Heidi, and a loving husband, Rory, whose extraordinary blog (This Life I Live) has brought millions of people to love and pray for her. Our hearts are broken, but our spirits are not broken. And even though we'll miss Joey and her angelic voice this side of Heaven, we know she is singing praises to our Lord and walking by the side of her Saviour. We prayed for her and her family. We shared her story and we were blessed by her song and her life. And now, we grieve for her family, and lift up Rory and their daughters in prayer for comfort, peace, and hope that when we all get to Heaven, we'll sing and shout the victory. 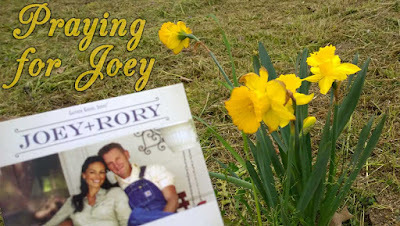 Joey+Rory demonstrated love, obedience, and charity through their songs, work, and sharing their story to help others. I, also, strive to live a life well-loved, and hope to leave the world a better place because of my actions of obedience and charity. So, hug your loved ones a little tighter, pepper your conversation with kind words, and show your love by doing good things for others. 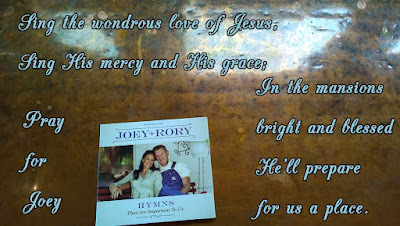 JOY is Jesus, Others, You, and Joey+Rory have blessed us with their courage and story. Carry on, Rory, Indiana, Hopie, and Heidi! We love you and pray for you. 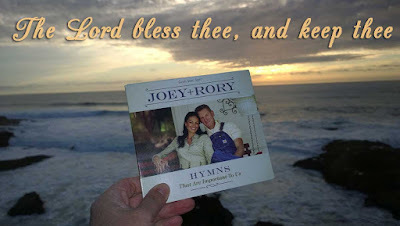 I'll let Rory's pictures and Joey's song speak to you. God bless you all! News Flash: Memorial Service with Bill and Gloria Gaither in Alexandria, Indiana, Joey's hometown.